I am getting into the Christmas spirit of giving and wanted to share my joy with you so I am offering a free giveaway through the Quilting Gallery's Blog Hop Party with Give-Aways. 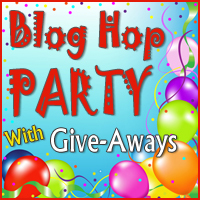 Dates for entering the Blog Hop Party Give-Away will be December 9th - 17th. Thank you Quilting Gallery and Michele Foster for sponsoring this giveaway! Join in the fun and receive a free give away! Neutrogena Norwegian Formula Fragrance Free Hand Cream - great for sewing, quilting, piecing and free motion quilting. It is greaseless and does not leaving blotching or stains on your fabric. Share your favorite quilting project that you like to give away as a gift. Share your favorite Christmas cookie? Winner will be randomly chosen on December 19th and mailed by the 24th. Will mail only in the United States. Go to the Give Away Tab on my home page to have a chance to win the free give away being sponsored by Sew Mama Sew shown on that page. Please comment on the specified post/message for the GIVEAWAY DAY under the Give Away Tab. Thank you and wishing the best to the lucky winner. I hope everyone is having as much fun as I am with blog hopping. This has been the first time for me for both the Quilters Gallery Blog Hop Party and Sew Mama Sew's Give Away Day! I have enjoyed stopping by each blogger's page learning more about you, your quilting projects and whatever else is on your mind or heart. I have given many hours of having fun and I have so many more of you to visit. Again post your comments here for the Quilters Gallery Blog Party before posting your comments for the GiveAway Day on the Give Away page. Hi, Joanie! My favorite quilted projects to give are table runners. I love making them for myself and for friends. Here's a really yummy cookie recipe. My oldest Granddaughter gave me the recipe and they are the best. on lightly greased cookie sheet. As I am just a new quilter this past year I have not done any Christmas projects so I hope that does not disqualify me. But in the future I'd like to do tree skirts for my children. In a large bowl cream together sugars and shortening till fluffy. Add eggs and vanilla; beat well. Stir together flour, baking soda, baking powder, and salt. Stir into creamed mixture. Stir in oats and gum drops. Roll into 1 inch balls and bake on greased cookie sheet at 350 degrees for 10-12 min. (lightly browned) Cool on wire rack. Makes 3 doz. I enjoy making table runners also and have made some for my daughters for Christmas gifts. I have also given them Christmas tree skirts in the past. That was several years ago, maybe I can do it again next year. Just a thought. I don't really have a special cookie recipe as I don't like baking cookies. I do occasionaly make chocolate chip cookies. I love making quilts as gifts but this year I made several pincushions and needle cases for quilting friends and tabletoppers for others. Oh and some pillows too. A favorite Christmas cookie is a Buckeye, a peanut butter ball dipped in chocolate. You didn't really ask for a recipe so hopefully you didn't need that! This year I am making quilts for our 7 grandkids, and I'm not done yet! I love making potholders as quick gifts. They are practical, but pretty and always well-received. My favorite Christmas cookie? Hmm.. that is a hard decision. I will say a pizzelle -it is a very crispy Italian cookie. Cream butter & sugar. Beat in eggs, milk, vanilla. Add dry ingredients. Stir in dates and nuts. Drop by rounded tablespoons on greasted baking sheet. Bake 350 for 10-12 min. sounds like a great prize. My favorite cookie is chocolate chunk oatmeal with dried cranberries. Yum. I'm making little gift boxes for money gifts for my family. This year I'm making some fabric boxes as Christmas gives. My favorite cookie is Pecan Butterscotch Chip cookies. I have to make a double batch to ensure that I'll have enough to give away. Thanks for the chance to win. I love giving small quilts as gifts. The patterns I most use for this are from From My Heart to Your Hands. Thanks for following, I am going to enjoy your blog and now am going to check out your cinch bags! I love making baby quilts, donation quilts for those in need due to some form of disaster and of course making tote bags which reminds me I haven't made any new one these past months,must try and fit in time for new and improved inventory. I love making throw quilts to giveaway. I think everyone needs a nice snuggle quilt. My favorite Christmas treat is not really a cookie but it's amazingly delicious. Cook sugar, corn syrup, and milk at medium boil, stirring occasionally, until in reaches soft ball stage. Mix cornflakes and peanuts in a large buttered bowl. Pour syrup over cornflakes and mix thoroughly. Pat into buttered pan. Cut when cool. My favorite gift this year is my mug rugs. I can share with so many! I just started a new quilt for my grandson, Using trees in the border like you but these are fused on and add so much to the panel of deer I am using. Will be baking next week, my favorite is a mincemeat cookie that I love and so does anyone I give them to. I managed to follow you *phew* and even though I won't be entered......I love to send kits that are quick to complete....usually table runners or place mats, ones that are achievable! thanks for visiting my blog and enjoy the partai!!!! I'm making tons of runners and lap quilts this year - everyone loves a good throw quilt! This year is a kitcheny gift giving year -- so far pot holders, hopefully a table runner or two and an apron~! My favorite gift was pillowcases--tons of them. It was a real stashbuster and everyone loved getting them. I am a terrible cookie maker, but I love Snickerdoodles. Quilting projects I give away at Christmas would be Hot Pads. You can never have enough. This year I am making trivets with rice and clove inside, lovely winter smells. My favorite Christmas cookie??? Well my fave is not really a cookie, I love English Toffee that I make at this time of year. I had asked a friend for his wife's recipe for 6+ years to no avail, then found the recipe in one of my mothers ancient Better Homes Magazine. But I do love exceptional buttery sugar cookies. I love giving mini quilts. Cookies - chocolate chip, oatmeal peanut-butter - the best of all worlds combined! Favorite gift to make and give - a boxed set of homemade ornaments. Favorite cookie - I don't bake, but chocolate chip cookies are good anytime. What a wonderful giveaway! I have never heard of the Fun & Done pattern/ruler! I always put Neutrogena on my hands before free-motion quilting. My favorite projects are table runners and I love Spritz cookies at Christmas. Thanks! I give a lot of lap quilts as gifts if I have enough time to make them, but for a quick gift I think tablerunners are great. I make Cappuccino Flats at Christmas and anytime I want a really delicious cookie. My favorite cookie is English Drop cookies -- chocolate, coffee, nuts raisins and vanilla frosting. My favorite gift to make and give is a flying geese quilt. Simple, easy, fast for me... and it looks like I put a lot of time into it. mug rugs are great to give away. I don't have a favorite cookie but I love my fruit cake - not your grandma's old fashioned with that yucky candied fruit - mine has dried fruit and nuts and chocolate chips! I'm just a beginning quilter and havent made any gifts yet but I am planning on quilting some table runners in the future for gifts. My favorite cookie is the monster cookies my mom makes. Merry Christmas! oh, wow, first I have to comment on your paper piecing!! that quilt is gorgeous!! I like to make Mug Rugs for Christmas gifts...they work for so many people!! or scarves if I knit! This year I visited the States and brought 12 quilted art journal/notebook covers with me to give as gifts...next year it'll be totally different! I like to make table runners for gifts. My favorite cookies are spritz or sugar cookies. Love to make table toppers for gifts. Love sugar cookies. I like to share mug rugs. I like making quilted trivets for gifts. Sift flour with salt. Cream butter with cream cheese and sugar, blend in egg, orange rind and almond extract. Add dry ingredients and blend well. Chill about 4 hours. Roll out dough into 2 10 x 14 inch rectangles. Spread each with half of the filling. Roll up starting with 10 inch side, wrap and chill overnight. Cut into 1/4 inch slices and bake 375 degrees, 10-12 minutes. Combine 6 oz. chocolate chips, 1/2 cup powdered sugar, and 1/4 cup orange juice in top of double boiler. Cook over hot water until mixture is smooth. Remove from heat, blend in 1/2 cup cream cheese and 1 cup finely chopped nuts. Cool. Thanks for the generous giveaway! Merry Christmas! Favorite quilty gift these days are mug rugs with matching mugs and my favorite cookie is the Mexican Wedding cookie. My favorite project to give away are large hotpads. I put the heat lining inside so they don't burn. Thanks for the great giveaway! I like to sew fabric yo yos for candlemats. Oh my goodness! I just found you through you entering my giveaway. Such a cute blog and great design ideas. I am now a follower! Oh yeah, I like to give away baby blankets, the look on the parents faces and then seeing the babies on them just make my heart sing. I really hope to do lots of table runners with place settings this year. I'm not a very motivated cook, so don't have any recipe's to share. I like to give away table runners. They are quick to make but always turn out cute. My favorite cookie is my frosted sugar cookies. In fact my kids and I made 3 double batches today to give to our neighbors and friend. Whew! Anyway, thanks for sharing, Happy Sewing! Cream the butter and the sugar together. Add the egg and mix well. Mix in the orange peel and dark corn syrup. Add the flour, baking soda, cinnamon, ginger, ground cloves and salt, mixing until well combined. Chill dough for at least 2 hours, I like to chill overnight. Preheat the oven to 375 degrees F (190 degrees C). Grease cookie sheets. On a lightly floured surface, roll dough out to 1/4 inch thick. Cut into desired shapes using cookie cutters. Place cookies 1 inch apart on the prepared cookie sheets. Bake for 10 to 12 minutes in the preheated oven, until cookies are firm and lightly toasted on the edges. My favorite quilting projects are small lap quilts. I'm giving my in-laws one each of the same pattern - a log cabin. Snickerdoodles are my favorite to make. Google it to find a recipe. My favorite gift to make and give away are Quillows. My favorite cookies to make are the ones my mom always made: Italian fried cookies, biscotti and pizzelles. I like to do table runners and mug rugs to give away to friends. Even other quilters like to get mug rugs. You can't have too many. I recently made gingerbread teddy bears. You can check them out on my blog. Thanks for the wonderful giveaway. I like to give away table runners, embroidered towels, embroidered Christmas ornaments, and embroidered books. I make prayer flags to give to my friends! I love making table runners as gifts. The most recent one had paper pieced Heart in Hands as borders with pieced stars in the center. I love making potholders- they give me the opportunity to make just one block of something (and if I like making it then I can make a quilt) plus everybody needs them. My favorite cookie is Mexican Hot Chocolate Cookies, the recipe is from Martha Stewart and I think it's on her website. The cookies are spicy like Mexican Hot Chocolate and so yummy. Thank you for the lovely giveaway. My favorite gift to give is a quilt to new mothers and brides. My favorite Christmas cookie is a family recipe for kipfel cookies...an almond crescent cookie. Thanks! My fave gift to make people are candle mats. They are so fun to do in cottons or wools and a pretty candle makes a complete gift. I LOVE fruitcake cookies. I know we hear a lot about fruitcake, but I love it. I like to make wall hangings for family and my cookie is peanut butter cookie. The family is spoiled on them I just can't make as many as before my back just will not let me do it any more. Happy Holiday to You and Yours. I like to make mug rugs to give. My cookie is a butter cookie..we always have them at Christmas. Thanks for the chance to win. Merry Christmas! I love peanut butter blossom cookies. I am new to quilting, but some year I'd like to make a bed quilt for each of my great neices and nephews. I like to make quick and easy totes and use them to hold other gifts, saves on wrapping and the totes are perfect for groceries. This year my favorite recipe is Betty Crocker Sugar Cookies mix, I know it's cheating but time isn't on my side and they are still fun to decorate. I recently discovered cake batter cookies and made them into sandwiches with icing in between two cookies. They are so scrumptious! I am fairly new to quilting and don't have a favorite... yet! I love making doll blankets and baby blankets, but I have no specific pattern from which I work. Can't wait to win you pack of goodies, however. I am a brand-new quilter (Just made my first quilt last month). My first one was a baby quilt for my newborn nephew and I felt so good giving him something that I made with him in my mind and so much love. I think baby quilts will always be number 1 for me. There is so much love in a quilt. My favorite Christmas recipe is not baked goods since I don't have a sweet tooth. It's a spinach-artichoke dip with water chestnuts served in a bread bowl. Fan-tastic! I always like to make table runners for gifts. And my favorite cookies is M&M cookies :-) Yum!! Table runners are my "go to gift". I love to make all kinds of Christmas candy. None are favorite; I love them all! Tablerunners are good gifts because they're relatively quick to make. So are hot pads & potholders. My favorite Christmas cookies are Italian almond crescent cookies sprinkled with powdered sugar, just like my grandma used to make! I love to make table runners and little pouches to give away to my friends. I love to make purses for others. My favorite cookie is an Italian cookie made with ricotta cheese in it. They are on my to do list for this week. Fabric ornaments are great to give! Thanks for the chance! Table runners are fun, quick and easy- often I can make one for friends in short notice. They can be for any season, so I love giving them away. Thanks for the giveaway opportunity! My favorite Christmas cookie would have to be Scottish Shortbreads! Merry Christmas! My favorite quilty gift to give is probably table runners--I've done several of those. It's a fun way for me to play with color and fabric combinations with quick results. My favorite Christmas cookie is definitely cut-outs, but only one particular recipe! I like to give away coasters and aprons. They are fast and easy and always (almost) look nice. And I think my favorite cookie is chocolate crinkles...look them up, they are amazing. Thanks for the giveaway! I would love to win this great prize. I am finishing a "Beep Beep" quilt for my grandson. It's a fun project and he patiently checks on my progress. My favorite cookie is my mom's Scottish shortbread. I love making cute little totes to give-a-way and I don't cook a lot but I do enjoy making oatmeal cookies for the holidays. I just use the recipe on the Old-Fashioned Oats box. Happy Holidays to you. I'm working on a quilt for a new niece. My favorite cookie is the Maple Pecan Pinwheel. It has orange zest in it and it tastes like magic. I like to make quilted table runners as gifts. They are always appreciated. My favorite cookie is the snickerdoodle. I like to make placemats. They are easy to fit to the recipient's style, and quick to make. My favorite treat is not really a cookie, but I use it on all my holiday cookie trays. It's called Haystacks – large marshmallows, dipped in melted caramel, then rolled in Rice Krispies. My grandma always made these. I like to make reversible placemat sets. I made some for a sister-in-law that are Christmas on one side and Valentines on the other. My favorite cookie is the bar cookie recipe my mother used to make that has gumdrop candies in it. My favorite quilt gift to make is hotpads. Fav cookie is chocolate chip. Gotta love the classics. I really like anything with ginger in it for the holidays: ginger snaps, and gingerbread men are among my favourites. My favorite thing to make and give away is a mug rug. Most folks love having something to put their coffee or cocoa on! Christmas cookie...hmmm....gotta be my grandmother's sugar cookies! I do quilts with my guild that are sonated to children in need (and are great for practicing free motion quilting on). Favorite cookies, either gingerbread folks or anything chocolate! I like to make and give something useful - like a bag holder for those plastic grocery bags... or maybe a nice set of pillowcases - possibly a "sock" filled with rice or deer corn to use as a heat / cold pack. My favorite cookies are fruit cake cookies. Using only candied cherry, candied pineapple, white grapes, lots of yummy pecans, and brandy / rum ... of course the brown sugar and flour to hold the goodies together - yuuuuumy! Thank you for the opportunity to win such a nice giveaway. Sweet giveaway! My favorite quilted giveaway is baby quilts and mug rugs. Mug rugs work up so quick you can give one to everyone and add a pop of color. My favorite cookies are gingerbread men. I made my first mug rug this year from a free tutorial from a blog. But, since I'm not really a quilter, I had to make another one so I could give it as a gift to a teacher at the school where I volunteer. I bought a cute coffee cup and made some peanut butter cookies. I'm making quilts this year for my immediate family and for friends an octagon table topper. i always love giving jelly roll lap quilts as gifts, and they are always well received! Thank you so much for the giveaway. I like to make a baby quilt for the first baby in a family. I love making throw size quilts to give a way! My favorite cookie is a Raisen filled cookie from my grandmothers recipe! This year I'm making some fabric bowls & putting in some goodies (wrapped of course). In the past I made lap quilts, but I am thinking some mug rugs & tea/coffee gifts for next year. Favorite Christmas cookies are snickerdoodles, but decorated...we love cinnamon! I have always made my kids gingerbread houses to decorate, but they are all grown up now, & no grandchildren yet. A lovely package & you thought about our tender skin as well! Thank you. I haven't given away "lots" of quilted gifts, yet, because I haven't made all that many. The 2 major things I've given so far have been wall hangings. I have 2 lap quilts almost ready (one's on the long arm and one is ready to be on there).